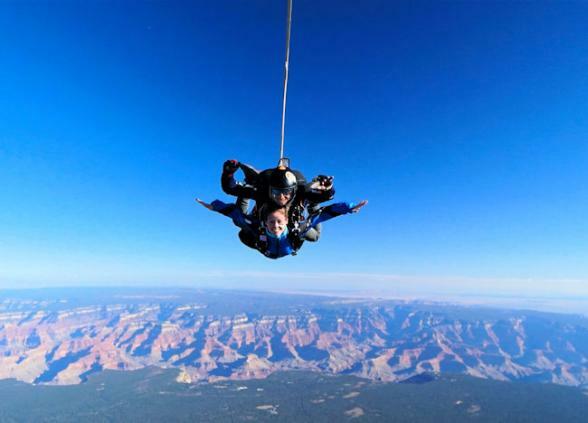 - Skydive the Grand Canyon with Bon Voyage! You can hike it, raft it or take a helicopter ride over it, but surely there's no more thrilling way to experience the Grand Canyon than skydiving. 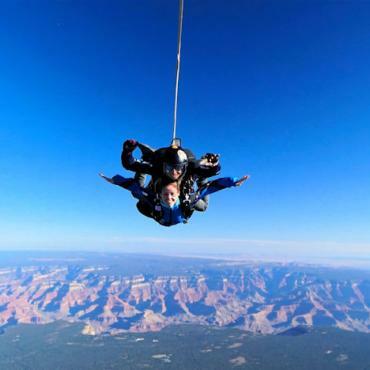 As well as being one of the world's foremost natural wonders, the Grand Canyon also happens to be one of the top ten skydive sites on the planet! Surely that earns a place on many a bucket list. Our tandem skydive experience is perfect for beginners, with no previous experience required, and pre-jump training provided. Based at the south rim, your package includes transfers, tuition and a scenic flight to jumping altitude two miles above ground. Then it's an adrenaline filled 45-second free fall at speeds up to 120mph. With parachutes deployed, there's ample time to admire the scenery (if you dare to open your eyes) on the gentle glide back to terra firma. Participants must be aged 18 and over. Transfers are available from Phoenix/Scottsdale and Las Vegas. To include this once-in-a-lifetime experience on your USA holiday, contact the tailor-made experts at Bon Voyage.